On Friday, February 2, 2018 the Dayton Book Fair will present three checks to our 2017 beneficiaries: Artemis Center, Caesar’s Ford Theatre Co. and Discover Classical-Dayton Public Radio. Each of those checks will be for somewhere in the neighborhood of ten thousand dollars. And we’ll announce the beneficiaries for 2018. There are three essential qualifications. Your organization must be a recognized non-profit in the state of Ohio. It must be a designated 501c3. The Deadline for applications is December 31, 2017. We are looking for a broad range of organizations who help benefit the people in our community through arts, education, social services and humanitarian efforts. The application process to become a beneficiary of the Book Fair Foundation could not be simpler— there’s no form or report or presentation. We only need a letter from your group. Your letter should tell us something about the group’s mission, your role in our community, and how you envision a partnership with the Book Fair Foundation. The board will meet early in January to talk about the applications we’ve received. Some of the things that we consider is what kind of “match” the applicant feels like for us— does this seem like a group whose mission is in concert with our own? We also look at the 990-N documents that each organization has filed. We work very hard to make the book fair a success. We’d like the gift we give to have significant impact on the organizations we choose. It’s possible that we may want to schedule an interview with finalists if we cannot agree on three. We get so many applications from wonderful organizations that choosing just three is quite a challenge. We require 40 volunteer hours from your organization. 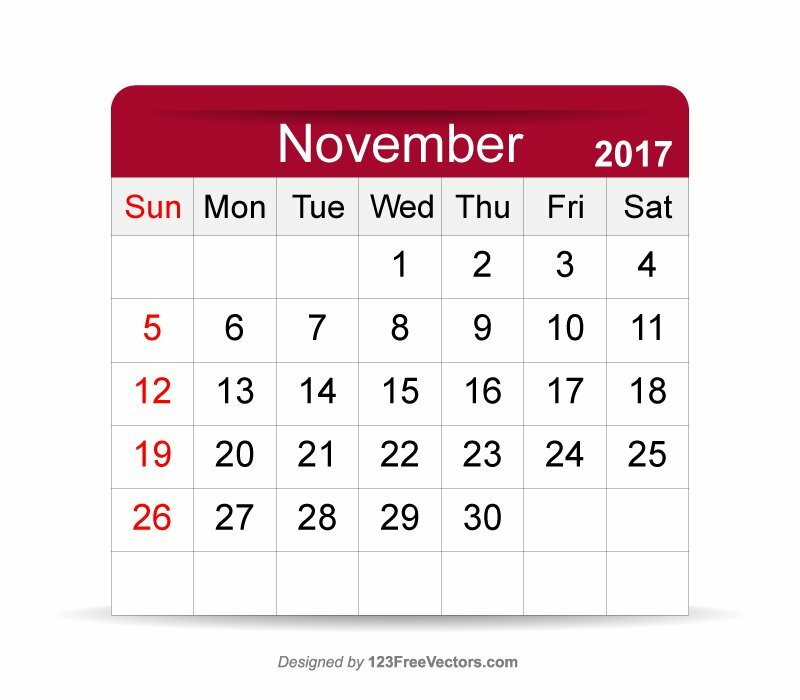 At least four of those forty hours must be fulfilled on the afternoon of November 12th, 2018 the Monday following the sale. 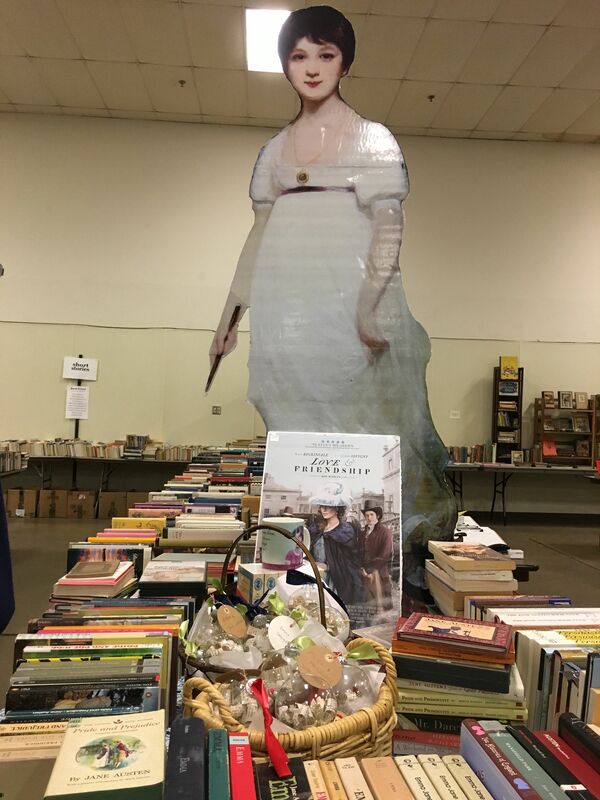 Additionally, we expect that you will promote the 48th Annual Dayton Book Fair among your own volunteers, staff and fans– through newsletter, website, Facebook page, emails or tweets. We want the people who love your organization to help support you by supporting the Book Fair. Letters of application should be sent to the Book Fair Foundation, 2181 Embury Park Rd, Dayton, OH 45414. You are also welcome to drop off your letter at our Embury Park Road office. We are open Tuesday, Thursday and Saturday 10 to 3 and Wednesday 1 to 7. We will announce the beneficiaries of the 2018 Dayton Book Fair on Thursday, February 2, 2018 at a reception for the 2017 beneficiaries, on this site, on our Facebook page and on our telephone greeting. If you have questions, you’re welcome to call us (937) 999-4491 to talk to us. Saturday at the Dayton Book Fair! It’s Saturday at the 47th Annual Dayton Book Fair! We’re open today from 9 a.m. to 8 p.m. and we have untold thousands of books, records and movies for your perusal and shopping pleasure! Come see us at the Coliseum Building, Montgomery County Fairgrounds, 1043 S. Main St. in Dayton. Today we’re having fun with Jane Austen . 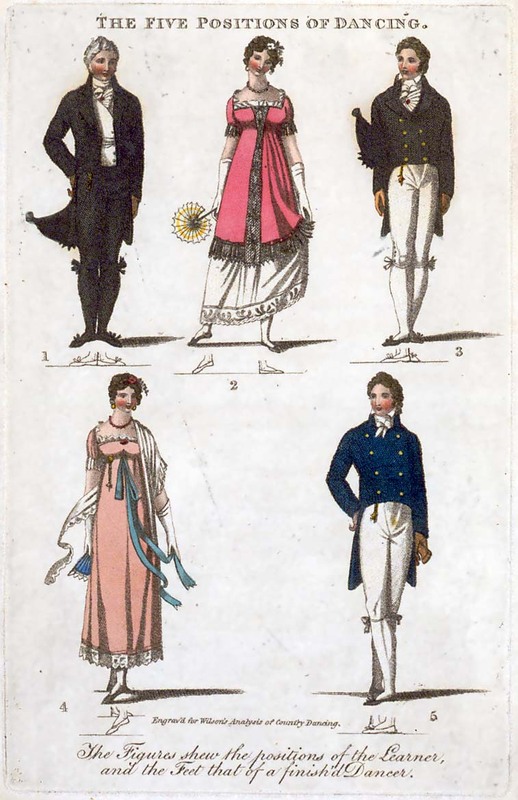 . . if you come dressed as Jane, or a character from an Austen novel, we’ll be happy to give you a ten dollar gift certificate. 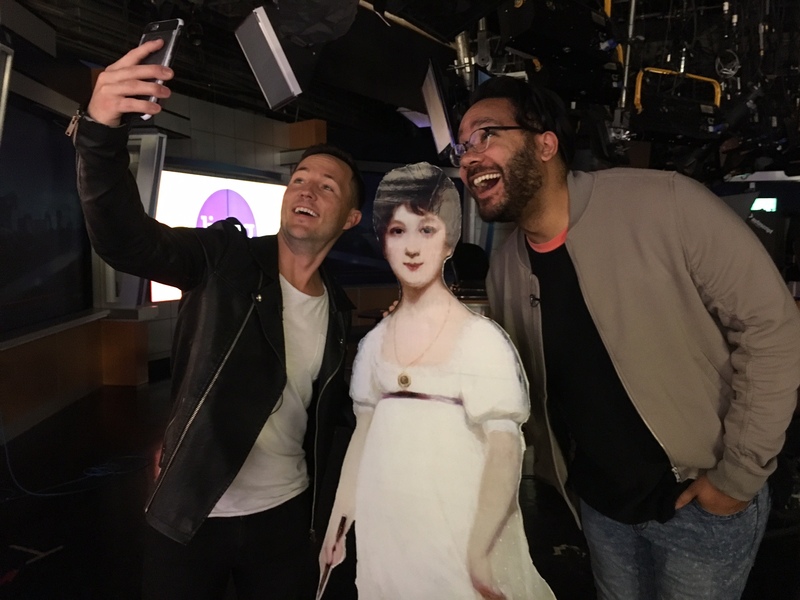 Don’t forget to take a selfie with Jane! After 4 p.m. we’ll have cupcakes for you from Moore Dessert Please and special discounts throughout the evening. Guys from Freedom’s Boombox taking selfies with Jane at the television station. Come on in to the Book Fair and you can take selfies with Jane too! Saturday is also the last day for our fabulous silent auction, ending at 6 p.m. 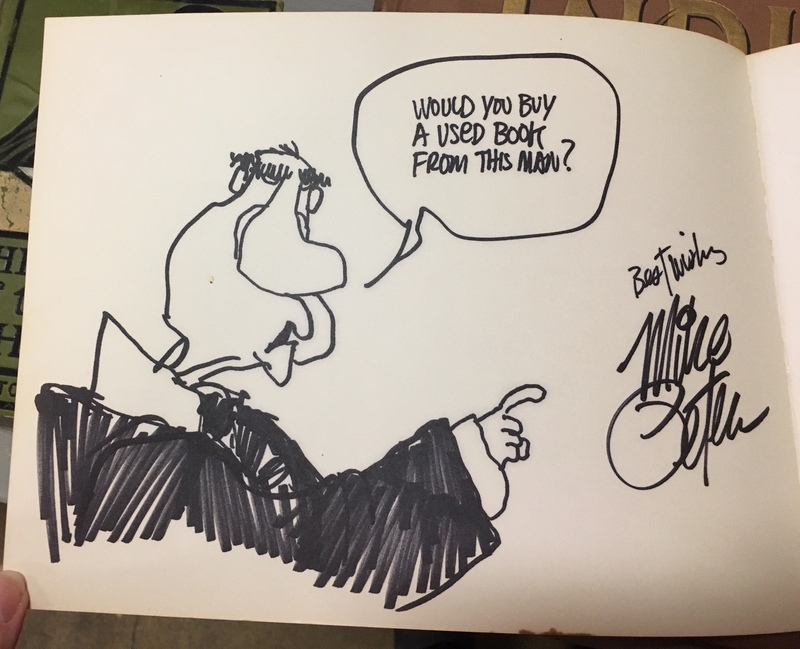 Among this year’s auction items are books signed by Jane Goodall, President Lyndon B. Johnson, famous pop culture photographer Herb Green; and a wonderful copy of Mike Peters’ The Nixon Chronicles, not just signed by Mike, but also featuring a hand-drawn cartoon of Nixon inside the front cover. You can see more about our auction at our website. And if you can’t make it today, don’t forget that tomorrow is our bag sale, with bags full of books at $7.50 (tax included) from 9 a.m. to 8 p.m. And on Monday, maybe you can give us a hand cleaning up with Monday Morning Clean Sweep from 8 a.m to noon— pay just one dollar to get in, and take as much as you want. The proceeds from this year’s sale benefits the Artemis Center, Caesar’s Ford Theatre Company and Discover Classical 88.1 Dayton Public Radio. 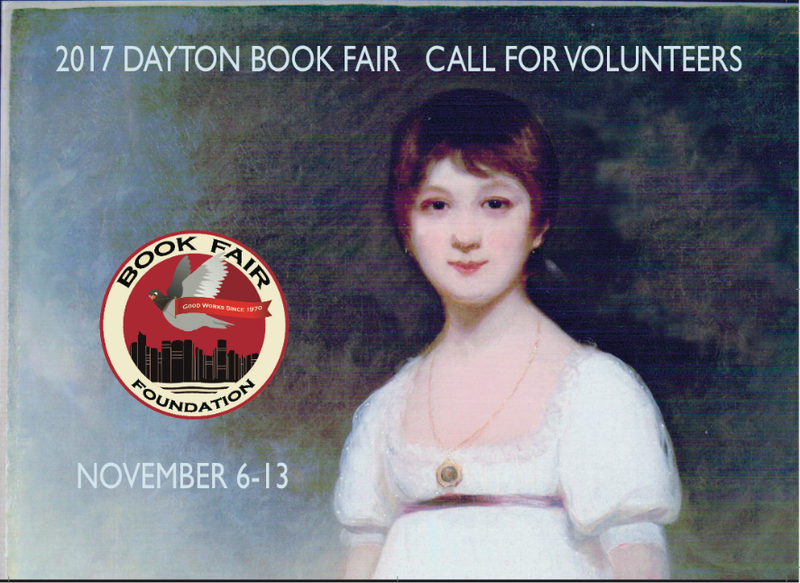 Dayton’s 47th annual Book Fair is fast approaching and we would love your help! We’ll be hosting a Book Pricing Blitz at our Book Loft at 2181 Embury Park Rd, Dayton on Sunday, October 29 from noon to five. Folks will be pricing and sorting hardcover, paperback and children’s books to get these last books to this year’s sale. It’s relaxed work with plenty of time for socializing and (of course) snacks. Even if you’ve never helped at the Book Loft before, come out and give it a try. We think you’ll have fun. Set up for the sale starts Monday, November 6th at noon at the Montgomery County Fairgrounds. The first day will largely involve moving pallets, dividers and tables into place. Tuesday, Wednesday and Thursday will be devoted to unpacking and arranging books on tables. We’ll start each morning at 9 and run till 5 or 6 in the afternoon. Informal lunch will be provided Monday, Tuesday and Thursday, and on Wednesday, we’ll have our customary catered lunch for volunteers at 12:30. The Book Fair begins Friday at nine a.m. and runs each day through Sunday at eight p.m. All kinds of festivities are planned for Saturday, so you won’t want to miss that! We’re asking Book Fair volunteers to please commit to four hour shifts (8:30 a.m. to 12:30 p.m.. 12:30 p.m. to 4:30 p.m. and 4:30 p.m. until 8:30 p.m.) As always we need readers, adders, baggers, straighteners and the like. If you had a job in the past that you loved and would like to do it again, just let us know. And finally, Monday. Monday is “Clean Sweep” from eight a.m. until noon. Bibliophiles pay a dollar to get in and can take as much as they want. In other years we have given the remaining books away (sometimes at considerable expense to us) to recyclers. We’ve decided we’re no longer comfortable seeing a few tons of goods books shipped off to be shredded, so we will be packing them all up this year and taking them back to the loft to be re-sorted and allocated to different charities and the like. With your help, we know we can do it! Proceeds from this year’s book sale benefit the wonderful folks at Artemis Center, Caesar’s Ford Theatre Co. and Discover Classical! Dayton Public Radio. We hope you will be as enthusiastic as we are about lending a hand to help such fantastic organizations. Please call the Book Loft to let us know how and when you can help— (937) 999-4491. We are there much of the time, but if you happen to get the answering machine, just leave a message and we can call you back. Also, feel free to email us at bookfair@earthlink.net. Our heartfelt thanks to you– we couldn’t do the work we do without the support of such an extraordinary volunteer team. Wristband Day Sunday October 1st! Wristband Day is nearly here! Beginning at 12:01 a.m. Sunday, October 1st you can order wristbands through our website that will secure your place in line on Opening Day of the Book Fair. 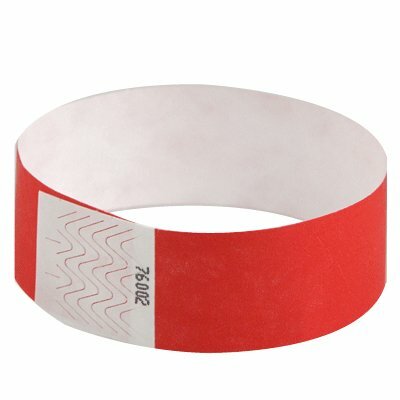 The wristbands are numbered sequentially and admission will be in the order of wristband number, with the lowest number being first in the door. The price is still just $11 for all day Friday (with in and out privileges of course). You can save a dollar by buying a wristband at the door that Friday, but you will be much further back in the line. The link to the wristband page is here, If you have any questions or concerns, feel free to give us a call at 937.999.4491 or send us message through our website or Facebook pages. 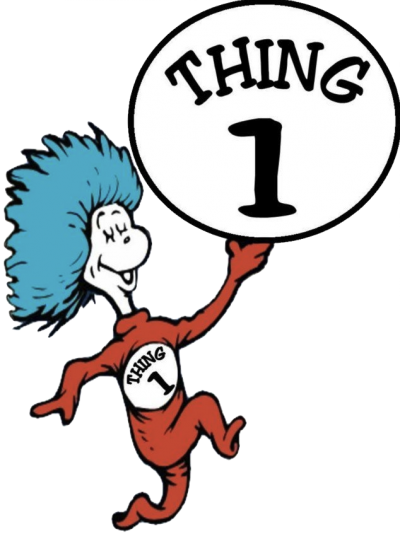 Is Thing Two at Your House? Have a Minivan you’d like to Donate? Thing One has given, and continues to give great service. We can fit 54 cartons of books in Thing One. But dear Thing is 14 years old, and occasionally has down days (new radiator! new fan!) and we are thinking the Book Fair Foundation needs THING 2! But it’s not just for the times that Thing One is under the weather— we are doing so many pick-ups (did you know we’ll pick up books from folks?) that scheduling is sometimes a challenge. And we also pick up leftover books from community library sales– and on Monday, we’re renting a second van so that we can fit in all of the great books we’re getting from our friends in West Milton. 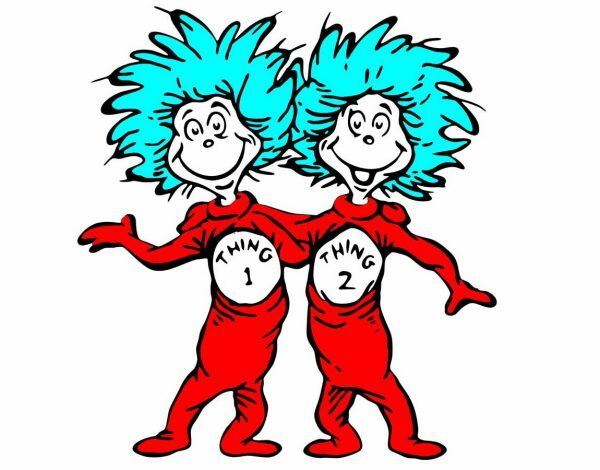 It would have been great to have Thing 2 along. So, we hope that Thing 2 will be a minivan with sliding doors and a solid floor that is in reasonable running condition. 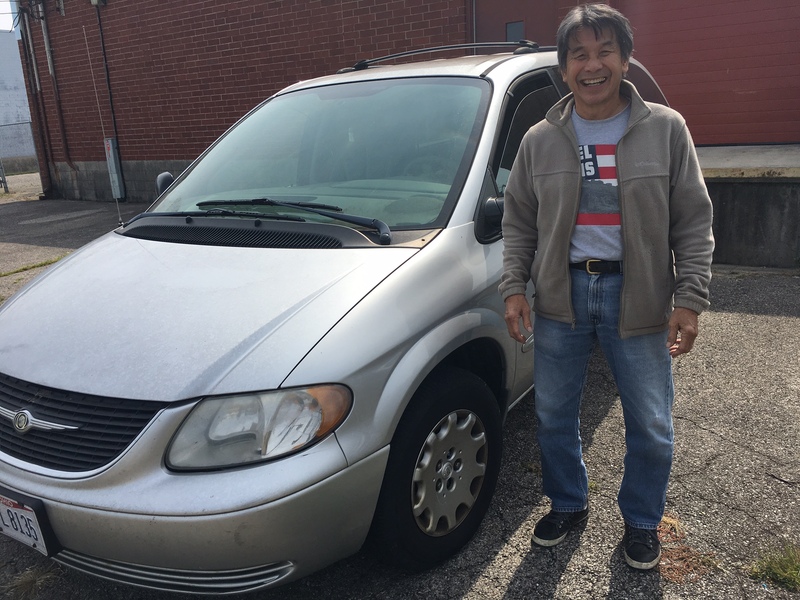 If you think that your minivan might be the perfect Thing 2, give us a call at 937.999.4491 or send us an email at info@daytonbookfair.com, or a message through this site or our Facebook page. Or just come on over and see us. Interested in Volunteering? Like ice cream? We’re always eager for new volunteers at our Book Loft, 2181 Embury Park Rd, in Dayton. We’re there Tuesday, Thursday and Saturday 10 to 3, and Wednesdays from 1 to 7. Our volunteers range in age from 16 to 93. If you’re a physical type person and want to carry boxes and move pallets, there’s plenty of that to be done. If you’d like to sit quietly with other bibliophiles, pricing and sorting books, well, have we got a chair for you! Interested in learning to sell books online? (Or maybe you already know how to sell books online, and want to give us a hand.) There are magazines to sort, puzzles to price, art prints to shrink-wrap, books of every size, shape and subject to pack. And everyday at 12:30 we take a break for ice cream. (We go through 4 cartons a week if you’re curious.) There’s even hot fudge and whipped cream if you like. Not to mention a whole fridge and pantry full of a wide variety of snacks. Many of our volunteers come on a regular schedule, others stop in periodically. It helps if you love books and have a good sense of humor. (And we do have some folks who don’t like ice cream, so if you’re one of those, don’t let that be a deal breaker.) Come on by and meet our all-volunteer staff, have a tour, sit down and stay for awhile. If you’d like more info, please feel free to call (937.999.4491) or email (info@daytonbookfair.com) or send us a message through this website or our Facebook page. The next Dayton Book Fair Round Up is just days away. 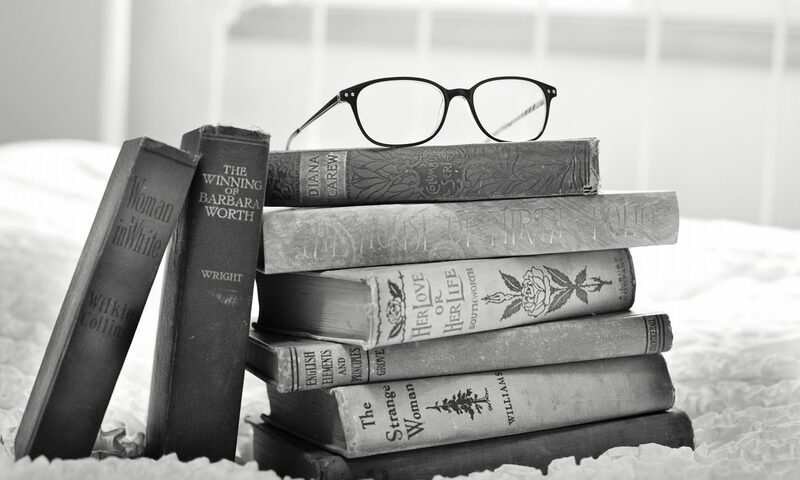 Our friends at Grismer Tire & Auto Service will again be collecting gently used books, vinyl records, movies, CDs, prints, puzzles, and games at all its locations in Dayton, Springfield, and Troy. Collection barrels will be available from Saturday, August 19, through Friday, August 25. Click here for Grismer Tire & Auto Service locations! Book Fair volunteers will also be available at eleven drop off locations on Saturday, August 19, between 10 a.m. and 1 p.m. The Book Loft – 2181 Embury Park Rd., Harrison Twp. Miami Valley Unitarian Universalist Fellowship – 8690 Yankee Rd., Washington Twp. And last but not least, our friends at Ceasar’s Ford Theatre (one of our 2017 beneficiaries) will be collecting items at their information table at the Fairborn Sweet Corn Festival on Saturday, August 19, and Sunday, August 20. Don’t forget that your donations to the Dayton Book Fair could be eligible for a tax deduction. Receipts are available wherever you drop off your items. We’re known for collecting books for our big sale, but we also give books away. 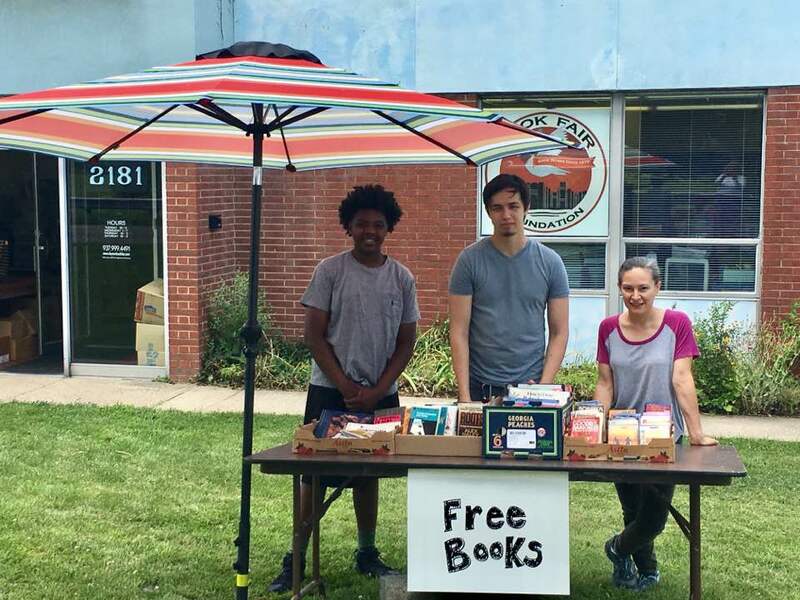 We have a fair amount of foot traffic past our office– usually people walking to the bus stop– so we’ve started giving away books under our big umbrella. A few weeks ago we had a call from the Ohio Reading Corps, a branch of Americorps, wondering if we could give them some books for their reading program. We could. Here are some of our volunteers with an Ohio Reading Corps tutor, just before we figured out how to put a pallet’s worth of books into his Honda Accord. 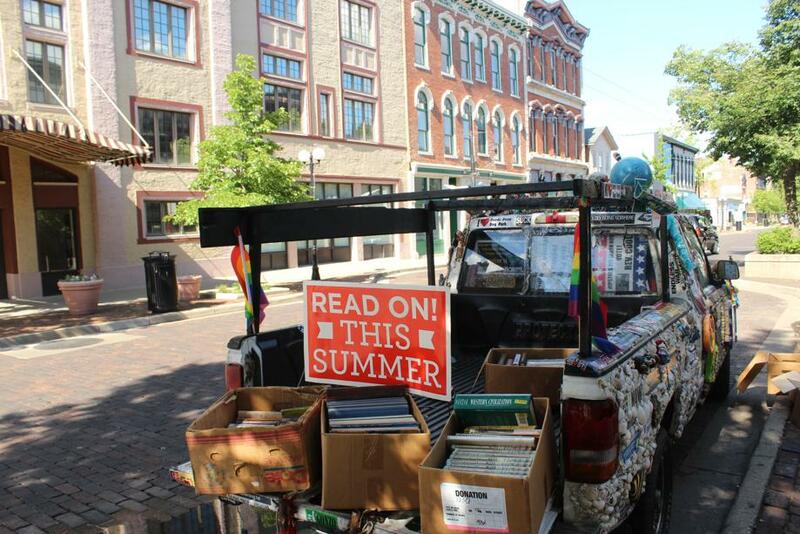 We give books to Dave Hurwitz as well– we hope you’ve seen his wonderful truck full of free books at festivals and in the Oregon District. We’ve given books to camps, preschools, clinics, community kitchens, shelters, and jails. If you have a group who could use some books, let us know. You can reach us at 937.999.4491 or send us a message through this site. And don’t forget that on the last day of our sale, Monday from eight a.m. to noon, you can pay one dollar to get in and take away all the books you want. Don’t Be Confused . . . 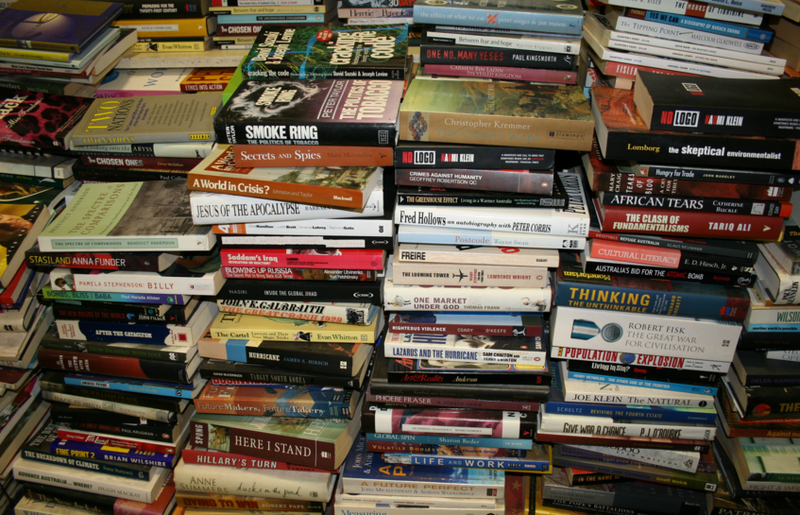 Yes, we know there’s a book sale going on at the Montgomery County Fairgrounds this weekend. That’s not us. That’s our good friends from the Friends of the Dayton Metro Library– you’ll remember their great sales at Hara Arena. Nothing’s sorted, but everything is just a buck. Stop in and see if you can find something to read! Their sale goes on through today, Saturday, June 3rd at 5 p.m. The Dayton Book Fair will be back in our regular spot Friday, November 10th through Monday, November 13th. Wristbands for Friday admission will go on sale at 12:01 a.m. October 1, 2017 on this website. .
We waited before we had 5000 bookmarks printed to be certain that our sale was going to be on the very last date the Montgomery County Fairground said was available. We waited ’till the absolute last minute before approving our half-page ad in the newspaper. Then, last week, we got the call. Would we like our old dates instead? Would we ever! 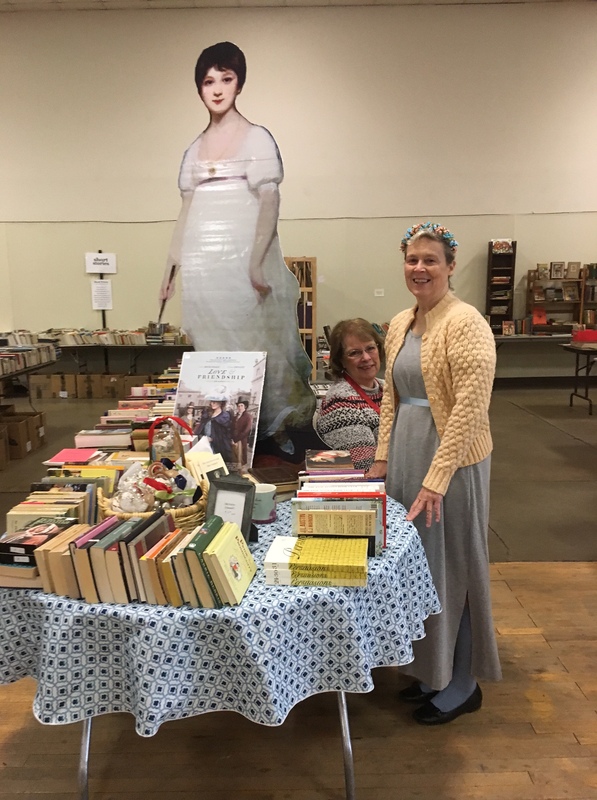 We are delighted to announce that the 47th annual Dayton Book Fair will be in its old home at the Coliseum Building at the Montgomery County Fairgrounds, Friday November 10th through Monday, November 13th. Friday, Saturday and Sunday hours are 9 a.m. to 8 p.m. Monday’s Clean Sweep is just 8 am till noon. Admission on Friday, November 10 is $10 at the door, or you can pre purchase numbered wristbands through this site starting at 12:01 a.m. Sunday, October 1st. Cost for online purchase is $11 per wristband (to cover Paypal fees and postage) and entrance will be in the numbered wristband order. Admission on Saturday, November 11th is free. We’ll have all kinds of interesting things going on Saturday with Jane Austen making a special appearance, along with story tellers, cupcakes and mystery discount cards after 6 p.m.
On Monday, November 13 it’s our special Clean Sweep. On Monday morning only from 8 a.m. to noon, pay one dollar to get in and take all the books, movies, records, magazines that you want. We’re the biggest used Book Sale in Ohio, and for sure there is something for everyone! Proceeds of the book sale benefit Artemis Center, Caesar’s Ford Theatre Co. and Dayton Public Radio. Don't forget to mark your calendar! Click here to subscribe to e-mails from the Dayton Book Fair.